The established Christian church in England, is the Church of England whose Supreme Governor is the Monarch of England. Other Christian traditions include Roman Catholicism, Methodism, and the Baptists. After Christianity, the religions with the most adherents are Islam, Hinduism, Neopaganism, Sikhism, Judaism, Buddhism, and the Bahá'í Faith. There are also organisations promoting irreligion, atheist humanism, secularism, and Satanism. Other religions have been notable in the past: Celtic paganism and Druidry in Iron-Age Britain; Roman and Gallo-Roman paganism and Mithraism under the Romans, and Anglo-Saxon and Norse paganism during the Middle Ages. Many of England's most notable buildings and monuments are religious in nature: Stonehenge, the Angel of the North, Westminster Abbey, and Canterbury and St Paul's Cathedral. The festivals of Christmas and Easter are widely celebrated in the country. Note that Christians were not counted by denomination in the 2011 census in England and Wales, although they were in Scotland and Northern Ireland. The largest Christian denomination is the Church of England, which is also the state church; the second largest is Roman Catholicism. Free church Protestants account for most of the remaining Christians. Saint George is recognised as the patron saint of England and the flag of England consists of his cross. Prior to Edward III, the patron saint was St Edmund and St Alban is also honoured as England's first martyr. The established religion of the realm is the Church of England, whose Supreme Governor is Queen Elizabeth II although the worldwide Anglican Communion is governed by the General Synod of its bishops under the authority of Parliament. 26 of the church's 42 bishops are Lords Spiritual, representing the church in the House of Lords. The dioceses of England are divided between the two provinces of Canterbury and York, both of whose archbishops are considered primates. The church regards itself as the continuation of the Catholic church introduced by St Augustine's 6th-century mission to Kent, although this is disputed owing to procedural and doctrinal changes introduced by the 16th-century English Reformation, particularly the Thirty-Nine Articles of Religion and the Book of Common Prayer. In 2010, the Church of England counted 25 million baptised members out of the 41 million Christians in Great Britain's population of about 60 million; around the same time, it also claimed to baptise one in 8 newborn children. Generally, anyone in England may marry or be buried at their local parish church, whether or not they have been baptised in the church. Actual attendance has declined steadily since 1890, with around one million attending Sunday services and three million joining Christmas Eve and Christmas services. It has around 18 000 active and ordained clergy. The Free Church of England is another Anglican denomination which separated from the Church of England in the 19th century in opposition to shifts in doctrine and ceremony that brought the established church closer to Roman Catholicism. The Free Church is in communion with the Reformed Episcopal Church in the United States and Canada. The Catholic Church in England and Wales is directed by its Bishops' Conference, whose current president—the Archbishop of Westminster—considers himself the continuation of the see at Canterbury. The Catholic Church is forbidden from using the names of the Anglican dioceses by the 1851 Ecclesiastical Titles Act. It is divided among five provinces headed by the archbishops of Westminster, Liverpool, Birmingham, and Southwark in England and Cardiff in Wales. The Catholic Church considers itself a continuation of the earliest Celtic Christian communities, although its formal hierarchy needed to be refounded by the Gregorian mission to the Saxon kingdoms in the 6th and 7th centuries and again following the English Reformation. Papal recognition of George III as the legitimate ruler of Great Britain in 1766 opened the way for the Catholic Emancipation, easing and ultimately eliminating the anti-Catholic Penal Laws and Test Acts. This process sometimes faced great popular opposition, as during the 1780 Gordon Riots in London. Daniel O'Connell was the first Catholic member of Parliament. The influx of large numbers of Irish Catholics during the Great Famine of the 1840s and '50s permitted the 1850 papal bull Universalis Ecclesiae to formally reconstitute the dormant dioceses of the Catholic church in Britain. More recently, the royal family has been permitted to marry Roman Catholics without fear of abdication. Recent immigration from Catholic countries, particularly Poland and Lithuania, has increased the church's numbers still more. Polling in 2009 suggested there were about 5.2 million Catholics in England and Wales, about 9.6% of the population, concentrated in the northwest. Some studies show that weekly attendance at Catholic masses now exceeds that of the Anglican services. No other church in England has more than a million members, with most quite small. Pentecostal churches are continuing to grow and, in terms of church attendance, are now third after the Church of England and the Roman Catholic Church. There are three main denominations of Pentecostal churches: the Assemblies of God in Great Britain (part of the World Assemblies of God Fellowship), the Apostolic Church, and the Elim Pentecostal Church. Countess of Huntingdon's Connexion is a small society of evangelical churches, founded in 1783, which today has 23 congregations in England. There is also a growing number of independent, charismatic churches that encourage Pentecostal practices at part of their worship, such as Kingsgate Community Church in Peterborough, which started with 9 people in 1988 and now has a congregation in excess of 1,500. Methodism developed from the 18th century onwards. The Methodist revival was started in England by a group of men including John Wesley and his younger brother Charles as a movement within the Church of England, but developed as a separate denomination after John Wesley's death. The primary church in England is the Methodist Church of Great Britain. The Salvation Army dates back to 1865, when it was founded in East London by William and Catherine Booth. Its international headquarters are still in London, near St Paul's Cathedral. There is one Mennonite congregation in England, the Wood Green Mennonite Church in London. The Cathedral of the Dormition of the Most-Holy Mother of God and the Holy Royal Martyrs in Gunnersbury. Most Greek Orthodox Church parishes fall under the jurisdiction of the Archdiocese of Thyateira and Great Britain, based in London and led by Gregorios, the Archbishop of Thyateira and Great Britain. Created in 1932, it is the diocese of the Ecumenical Patriarch of Constantinople that covers England, Wales, Scotland and Ireland as well as Malta. A Greek Orthodox community already existed at the time the UK was formed, worshipping in the Imperial Russian Embassy in London. However, it was another 130 years until an autonomous community was set up in Finsbury Park in London, in 1837. The first new church was built in 1850, on London Street in the City. In 1882, St Sophia Cathedral was constructed in London, in order to cope with the growing influx of Orthodox immigrants. By the outbreak of World War I, there were large Orthodox communities in London, Manchester and Liverpool, each focused on its own church. World War II and its aftermath also saw a large expansion among the Orthodox Communities. Today, there are seven churches bearing the title of Cathedral in London as well as in Birmingham (the Dormition of the Mother of God and St Andrew) and Leicester. In addition to these, there are eighty-one churches and other places where worship is regularly offered, twenty-five places (including University Chaplaincies) where the Divine Liturgy is celebrated on a less regular basis, four chapels (including that of the Archdiocese), and two monasteries. As is traditional within the Orthodox Church, the bishops have a considerable degree of autonomy within the Archdiocese. The Greek Orthodox Church of St Nicholas in Toxteth, Liverpool, was built in 1870. It is an enlarged version of St Theodore's church in Constantinople and is a Grade II Listed building. There are various Russian Orthodox groups in England. In 1962, Metropolitan Anthony (Bloom) of Sourozh founded and was for many years the bishop, archbishop and then metropolitan bishop of the diocese of the Russian Orthodox Diocese of Sourozh, the Moscow Patriarchate's diocese for Great Britain and Ireland. It is the most numerous Russian Orthodox group in the country. There are also the Russian Orthodox Church Outside Russia churches as well as some churches and communities belonging to the Patriarchal Exarchate for Orthodox Parishes of Russian Tradition in Western Europe's Episcopal Vicariate in the UK. As well as the Russian and Greek Orthodox churches, there are also the Serbian Orthodox Church and the Ukrainian Orthodox Church all in London as well as a non-canonical Belarusian Autocephalous Orthodox Church in Manchester. The Antiochian Orthodox Church have the St. George's Cathedral in London and a number of parishes across England. All Coptic Orthodox parishes fall under the jurisdiction of the Coptic Orthodox Church of Alexandria Pope of Alexandria. The Coptic Orthodox Church in the United Kingdom is divided into three main parishes: Ireland, Scotland and North England; the Midlands and its affiliated areas; and South Wales. In addition, there is one Patriarchal Exarchate at Stevenage, Hertfordshire. Most British converts belong to the British Orthodox Church, which is canonically part of the Coptic Orthodox Church. There is also the Eritrean Orthodox Tewahedo Church and the Ethiopian Orthodox Tewahedo Church in London. There is also the Armenian Apostolic Church in London. Muslim population in English local authority areas. The East London Mosque was one of the first mosques in England to be allowed to broadcast the adhan using loudspeakers. According to the 2011 Census, 2.7 million Muslims live in England where they form 5.0% of the population. Although Islam is generally thought of as being a recent arrival to the country, there has been contact with Muslims for many centuries. An early example would be the decision of Offa, the eighth-century King of Mercia (one of the Anglo-Saxon kingdoms existing at that time), to have coins minted with an Islamic inscription on them—copies of coins issued by the near-contemporary Muslim ruler Al-Mansur. It is thought that they were minted to facilitate trade with the expanding Islamic empire in Spain. Muslim scholarship was well-known among the learned in England by 1386, when Chaucer was writing. In the Prologue to the Canterbury Tales, there is among the pilgrims wending their way to Canterbury, a 'Doctour of Phisyk' whose learning included Razi, Avicenna (Ibn Sina, Arabic ابن سينا) and Averroes (Ibn Rushd, Arabic ابن رشد). Ibn Sina's canon of medicine was a standard text for medical students well into the 17th century. Today Islam is the second largest religion in England with 38% of Muslims living in London, where they make up 12.4% of the population. There are also large numbers of Muslims in Birmingham, Manchester, Bradford, Luton, Slough, Leicester and the mill towns of Northern England. 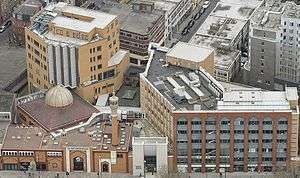 Notable mosques include the East London Mosque, London Central Mosque, Al-Rahma mosque, Jamea Masjid, Birmingham Central Mosque, Finsbury Park Mosque, Al Mahdi Mosque, London Markaz and Markazi mosque and the Baitul Futuh Mosque of the Ahmadiyya, which acts as its national headquarters. 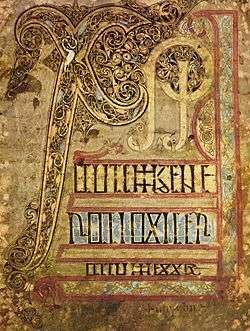 Until the 20th century, Judaism was the only noticeable non-Christian religion having first appeared in historical records during the Norman Conquest of 1066. In fact, from 1290 to 1656, Judaism did not officially exist in England due to an outright expulsion in 1290 and official restrictions that were not lifted until 1656 (though historical records show that some Jews did come back to England during the early part of the 17th century prior to the lifting of the restriction). 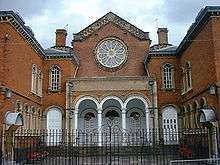 Now, the presence of the Jewish culture and Jews in England today is one of the largest in the world. The Bahá'í Faith started with the earliest mentions of the predecessor of the Bahá'í Faith, the Báb, in The Times on 1 November 1845, only a little over a year after the Báb first stated his mission. Today there are Bahá'í communities across the country from Carlisle to Cornwall. Early Hindus in England were mostly students during the 19th century. There have been three waves of migration of Hindus to England since then. Before India's Independence in 1947, Hindu migration was minuscule and largely temporary. The second wave of Hindu migration occurred in the 1970s after the expulsion of Gujarati Hindus from Uganda. Initially, Hindu immigration was limited to Punjabi and Gujarati Hindus, but, by 2000, small Hindu communities of every ethnicity could be found in England. England is also host to a large immigrant community of Sri Lankan Hindus who are mostly Tamils. The last wave of migration of Hindus has been taking place since the 1990s with refugees from Sri Lanka and professionals from India. However, there is becoming an increasing number of English Western Hindus in England, who have either converted from another faith or been an English Hindu from birth. The first Sikh Gurdwara (temple) was not established until 1911, at Putney in London. The first Sikh migration came in the 1950s. It was mostly of men from the Punjab seeking work in industries like foundries and textiles. These new arrivals mostly settled in London, Birmingham and West Yorkshire. Thousands of Sikhs from East Africa soon followed. This mass immigration was caused by Idi Amin's persecution of ethnic groups in Uganda, with thousands forced to flee the region in fear of losing their lives. The earliest Buddhist influence on England came through the UK's imperial connections with South East Asia, and as a result the early connections were with the Theravada traditions of Burma, Thailand, and Sri Lanka. The tradition of study resulted in the foundation of the Pali Text Society, which undertook the task of translating the Pali Canon of Buddhist texts into English. 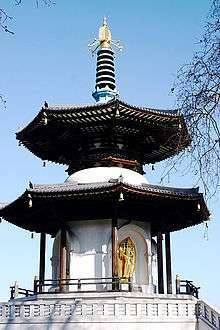 In 1924 London's Buddhist Society was founded, and in 1926 the Theravadin London Buddhist Vihara. The rate of growth was slow but steady through the century, and the 1950s saw the development of interest in Zen Buddhism. Wooden god-head idol at Eallhālig Temple, The Wrekin, in Shropshire, a holy area for local Heathens. At the 2011 census 75,281 people in England identified as Pagan, doubling compared to the figures of the 2001 census. Paganism in England is dominated by Wicca, founded in England itself, the modern movement of Druidry, and forms of Heathenry. Wicca was developed in England in the first half of the 20th century. Although it had various terms in the past, from the 1960s onward the name of the religion was normalised to Wicca. Germanic Heathenism in Britain is primarily present in two forms: Odinism, an international Germanic movement and Anglo-Saxon Heathenry, Esetroth or Fyrnsidu (Old English: "Ancient Custom"), a movement represented by independent kindreds characterised by a focus on local folklore as the source for the reconstruction of the ethnic religion of the English people. With recent efforts to establish their own media influence through the agency English News. Both Odinism and Esetroth draw inspiration from the Anglo-Saxon identity and culture of England, with almost no difference between them, other than in terminology and organisation, with Esetroth movements having experienced a recent prominence and motivation. Various independent Anglo-Saxon faith's kindreds exist such as the Wuffacynn of Suffolk and Northern Essex, the England-wide "English Esetroth" community organization, the Fealu Hlæw Þeod based in Hathersage and Peak District and the Þunorrad Þeod covering the Kingdom of Mercia. Folkish Anglo-Saxon kindreds have been primarily organising through "English Esetroth" since 2014 in a series of private gatherings. All the listed groups operate private moots, blots and sumbels, Anglo-Saxon kindred networking spiked in its frequency and web prominence during 2014 due to English News. During the Iron Age, Celtic polytheism was the predominant religion in the area now known as England. Neo-Druidism grew out of the Celtic revival in 18th-century Romanticism. The 2011 census states there are 4,189 Druids in England and Wales. A 2012 analysis by the Order of Bards, Ovates and Druids estimates that there are between 6,000 and 11,000 Druids in Britain. These faiths, all of which are considered to be pagan, have all been predominant in the regions that later made up England, though were all made extinct through Christianisation. Gallo-Roman religion formed when the Roman Empire invaded and occupied the Brythonic peoples. Elements of the native Brythonic Celtic religion such as the druids, the Celtic priestly caste who were believed to originate in Britain, were outlawed by Claudius, and in 61 they vainly defended their sacred groves from destruction by the Romans on the island of Mona (Anglesey). However, under Roman rule the Britons continued to worship native Celtic deities, such as Ancasta, but often conflated with their Roman equivalents, like Mars Rigonemetos at Nettleham. The founding of a temple to Claudius at Camulodunum was one of the impositions that led to the revolt of Boudica. 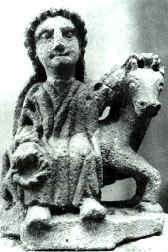 Eastern cults such as Mithraism also grew in popularity towards the end of the occupation. The Temple of Mithras is one example of the popularity of mystery religions among the rich urban classes. In the Dark Ages, immigrants from the European continent arrived, bringing Anglo-Saxon paganism, a subset of Germanic paganism, with them. Later, after most of the Anglo-Saxon peoples had converted to Christianity, Vikings from Scandinavia arrived, bringing with them Norse paganism. 24.7% of people in England declared no religion in 2011, compared with 14.6% in 2001. These figures are slightly lower than the combined figures for England and Wales as Wales has a higher level of irreligion than England. Norwich had the highest such proportion at 42.5%, followed closely by Brighton and Hove at 42.4%. 1 2 3 4 5 "2011 Census: KS209EW Religion, local authorities in England and Wales". ons.gov.uk. Retrieved 15 December 2012. ↑ "Religion (2001 Census)". data.gov.uk. Retrieved 17 December 2012. ↑ Gledhill, Ruth (15 February 2007). "Catholics set to pass Anglicans as leading UK church". The Times. London. Archived from the original on 18 September 2011. Retrieved 18 February 2015. ↑ "How many Catholics are there in Britain?". BBC. London. 15 September 2010. Retrieved 18 February 2015. ↑ "2009 Church Statistics" (PDF). Church of England. 2009. ↑ See the pages linked from "Life Events". Church of England. .
↑ Bowler, Peter J. (2001). Reconciling science and religion: the debate in early-twentieth-century Britain. Chicago: University of Chicago Press. p. 194. .
↑ "Facts and Stats". Church of England. ↑ "Research and Statistics". Church of England. Retrieved 9 May 2012. .
↑ "Royal nod for daughters, Catholics". The Age. Melbourne. 29 October 2011. 1 2 Wynne-Jones, Jonathan (23 December 2007). "Britain has become a 'Catholic country'". The Telegraph. Retrieved 18 February 2015. ↑ "Numbers Game," The Tablet, 31 October 2009, 16. ↑ "Who are the Mennonites?". London Mennonite Centre. Retrieved 2008-09-05. ↑ "Current Hierarchs of the Archdiocese of Great Britain". Orthodox Research Institute. 2008. Retrieved 2008-09-05. ↑ Archbishop Gregorios of Thyateira & Great Britain (2000-04-21). "The Archdiocese of Thyateira and Great Britain and Orthodoxy in the British Isles". Archdiocese of Thyateira and Great Britain. Retrieved 2008-09-05. ↑ "Welcome". Russian Orthodox Diocese of Sourozh. Archived from the original on 23 June 2008. Retrieved 2008-09-05. ↑ "Parishes, Missions and Clergy". Greek Orthodox Church of Antioch Deanery of the United Kingdom and Ireland. 2008. Retrieved 2008-09-05. ↑ Eade, John (1996). "Nationalism, Community, and the Islamization of Space in London". In Metcalf, Barbara Daly. Making Muslim Space in North America and Europe. Berkeley: University of California Press. ISBN 0520204042. Retrieved 24 April 2015. The mosque committee was determined from the outset, moreover, to remind local people of the building’s religious function as loudly as possible. As one of the few mosques in Britain permitted to broadcast calls to prayer (azan), the mosque soon found itself at the center of a public debate about "noise pollution" when local non-Muslim residents began to protest. ↑ Bahá'í Information Office (United Kingdom) (1989). "First Public Mentions of the Bahá'í Faith". Archived from the original on 2008-02-26. Retrieved 2008-02-18. ↑ Hutton, Ronald (1999). The Triumph of the Moon: A History of Modern Pagan Witchcraft. Oxford, NY: Oxford University Press. p. vii. ISBN 0-19-820744-1. ↑ Seims, Melissa (2008). "Wica or Wicca? - Politics and the Power of Words". The Cauldron (129). ↑ Robert Booth (11 December 2012). "Census 2011 data on religion reveals Jedi Knights are in decline". The Guardian. Retrieved 11 December 2014. ↑ "UK 2011 Census Publishes Figures for Druids". The Order of Bards Ovates & Druids. Retrieved 12 January 2012. ↑ Simon Rogers (11 December 2012). "Census 2011: how many Jedi Knights are there in England & Wales?". theguardian.com. Retrieved 11 December 2014. ↑ "Differences in religious affiliation across local authorities". Office for National Statistics. Retrieved 2012-12-15.